The Maine Page Turner: Beware of Bears! Maine is such a beautiful state, it's easy to forget the jewel next door, White Mountain National Forest. This was our little summer family vacation getaway this year. Dolly Copp, nestled in the Presidential Range, is a lovely campground for low-tech camping. We don't need much more than dry weather to be, well, happy campers. But the warnings about BEARS are ubiquitous. 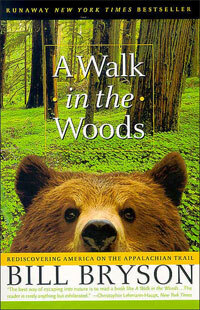 I brought along Bill Bryson's A Walk in the Woods, his adventures (and misadventures) on the Appalachian Trail. Relaxing in our tent while Hubby & Son went off for firewood, they returned to find me absolutely laughing OUT LOUD; they could hear me guffawing from yards and yards away. Bryson returns from 20 years living abroad and discovers that the AT crosses close to his home in Hanover, NH. He decides to "thru-hike" the whole more-than-2100-mile length along with an unlikely partner: a high school friend who is an overweight, recovering alcoholic with a penchant for Little Debbie snacks. Shopping for equipment, details of his significant fears around black bears, his rude awakening to the rigor of the AT, enduring a major cold snap AND a snowstorm early in his hike. A less than endearing depiction of Southern culture. A frightful night spent listening to rustling and snuffling in the bushes.... all hysterically funny. I hadn't laughed that hard at a book for quite some time. Along with all his descriptions of the various conditions he has to endure - bad camping experiences, noodles day-in-and-day-out, and an array of interesting and bizarre hikers and townies - Bryson is dismayed and frustrated with flawed systems that affect the AT: underfunding within the U.S. Park Service, land mismanagement by the Department of Agriculture, the ineptitude of the Army Corps of Engineers. He points out how local color and charm have been drowned out by America's junky retail & fast food, rather than the farms & small downtowns common before 1960 or so. He even suggests that small farms would be preferable to nothing but trees. American vacationers drive distances to visit natural wonders, but end up at mini-golf, amusement parks, eating more fast food. So much for communing with nature. The journey gives him a new appreciation for, well, WALKING. He mourns that no one walks anywhere anymore. I agree, most of us do NOT walk enough. I'm terribly guilty of it myself - the supermarket is walking distance from my house, but I always drive. A Walk in the Woods was written in 1997, and I think that walking (and biking) have made something of a comeback (at least in spirit, if not always in practice) with gas prices so high for the last 11 years. Bryson witnesses and discusses all manner of environmental devastation. But for the record, A Walk in the Woods is far from doom and gloom. He falls in love with the AT, and dear reader, you will too. And even brighter, some of the flaws of the Trail have been ameliorated since 1997! This is a truly wonderful book. It's about 15 years old, but it's as fresh as if he had written it this year. Back to my own camping trip: between the signs all over the campground and the book, I was pretty freaked out about bears. So we kept the tidiest campsite EVER. Every crumb was locked away in our car, and I didn't even keep hand lotion or contact solution in our tent. And I made sure to make a bit of noise as I walked to the restroom in the dark (past the trash dumpster)... the last thing I wanted to do was surprise a bear! We hiked about a mile of the AT as part of a 3-mile loop we did in Pinkham Notch. I'm eager for much more. And although we saw signs of bears, we didn't encounter any. PPS - Happy 75th birthday, AT! Mumford & Sons - we love you! The Olympics are stealing my reading time!